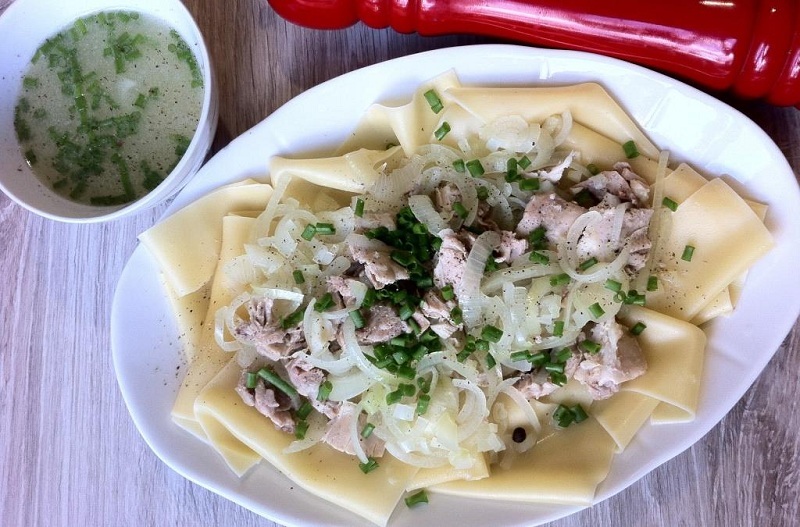 Every fan of oriental cuisine at least once tried beshbarmak – surprisingly tasty Kazakh dish of juicy meat and homemade noodles with broth. No celebratory feast and warm hospitality can do without it, and for the Sunday dinner experienced housewives-cooks often serve this fragrant dish. And although in the traditional recipe for making beshbarmak only beef, horsemeat or lamb is used, today we will try to prepare a more affordable version of this hearty meal using pork. 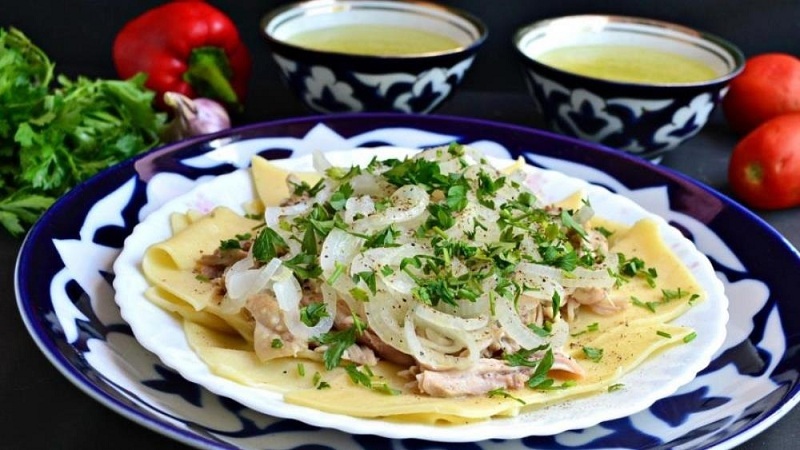 Choosing pork, you should give preference to meat pieces on the bone – they make more rich broth and, accordingly, juicy and nourishing beshbarmak. However, if there is only pulp on hand, this is not a reason to refuse to cook an oriental dish – you can spice up the pork with several bones especially for the soup, or add a couple of pieces of bacon, which will give the dish the necessary fat. ground black or red pepper – to taste. Cooking beshbarmak from pork should be done in stages: this way you can save time as much as possible without losing even the slightest nuance of a rather complex recipe. 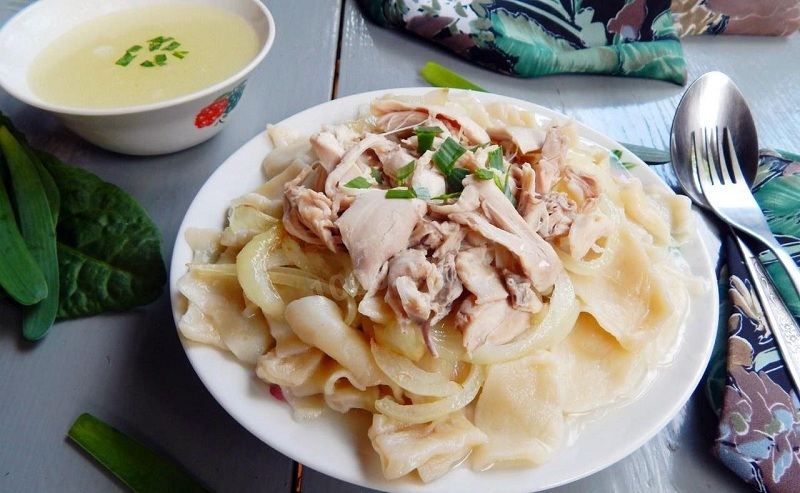 The step-by-step recipe can be divided into boiling pork, cooking noodles and combining ingredients into one harmonious dish. So let’s get started. Virtually every housewife who has ever cooked a rich bone soup represents how to properly prepare a fragrant and not too fat broth. 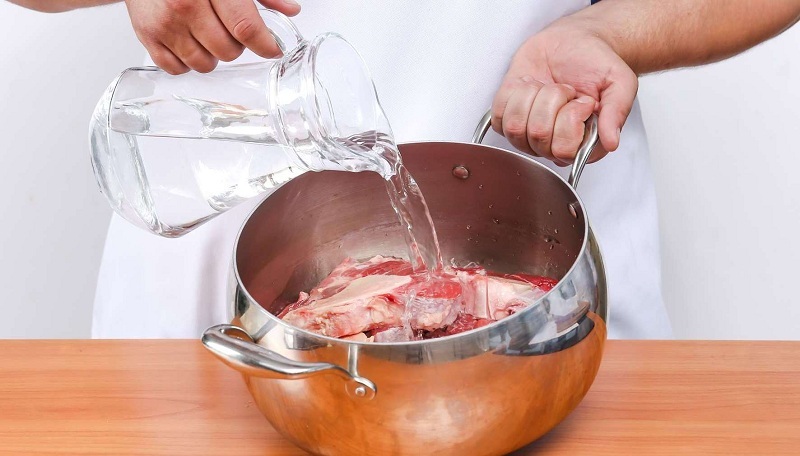 However, in the preparation of beshbarmak, there are several key features, because as a result, the meat should turn out to be tender and easily separated from the bone, and the liquid itself should be perfectly transparent without the slightest hint of turbidity. Rinse the meat thoroughly, then chop it into pieces of medium size (about half of the palm of your hand) and again rinse thoroughly under running water. Put the semi-finished meat in the pan at least 6 liters, pour 4 liters of cold water and put on the fire. Bring the future broth to a boil and immediately reduce the heat so that the liquid does not fill the cooker. Be sure to remove the resulting foam – otherwise, the soup will turn out to be cloudy and unappetizing. Important! The foam will have to be removed regularly throughout the cooking time. Try to do this as carefully as possible, without “breaking up” or stirring it. If this manipulation is difficult for you, do not despair – there are many ways to make the broth perfectly transparent already in readiness. For example, you can hammer a chicken egg into hot water, mix it thoroughly so that it boils, and then pass it several times through a gauze napkin – the protein will bind all the foam particles that will settle on the napkin, while the broth will turn out to be transparent-golden and incredibly delicious. Cook the meat for about 3-4 hours, periodically adding warm water to the required volume. Somewhere in an hour and a half before full readiness, add salt, bay leaves and peas of allspice to taste in a saucepan. After the pork for beshbarmak is ready, remove it from the water and set aside on a separate plate, strain the soup through several layers of gauze and leave to cool. When the liquid is cold enough to put it in the fridge, send it there at least half an hour. During this time, the fat will harden; forming a crust on the surface, and its surplus will be easy to remove. Carefully sift the flour through a sieve so that you can separate all the lumps and give it the necessary fluff. Beat in the pre-shaken eggs into the flour, salt and add water. Tip! If the pork broth has already cooled down by this time, you can use it instead of water – this will give the noodle a spicy aroma and juiciness. Knead the dough, pouring the flour down to the desired consistency. The resulting semi-finished product should not stick to the table and hands. Roll the dough for beshbarmak into a ball, wrap it with cling film and send to a cold place for about half an hour. 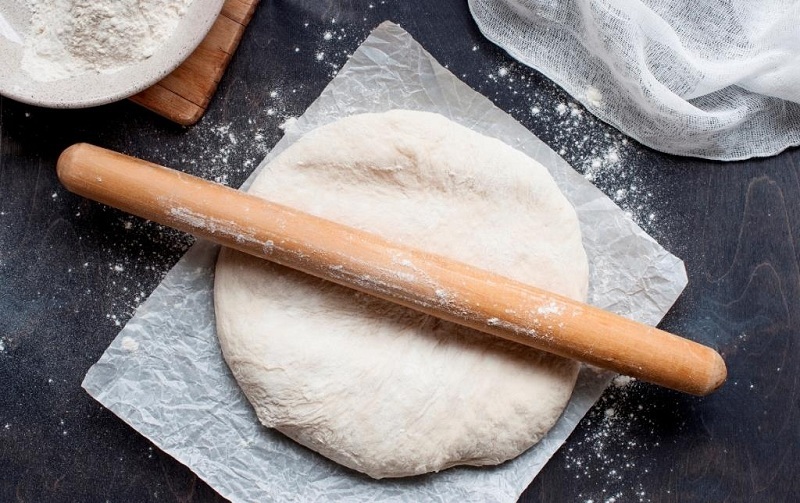 After the dough has settled, carefully sprinkle the working surface of the table with sifted flour, pinch off a small piece of the ball (about half the adult fist), and cover the rest of it with a film again – it will not have time to erode. Roll the separated dough into a thin layer about 2-4 mm thick, cut into wide strips, and then divide them into diamonds of the same size. Repeat the manipulation as many times as necessary until all the dough has been divided into diamonds. Put the finished noodle diamonds on the parchment paper sprinkled with flour and leave to dry slightly in a warm oven (about 50 degrees) with the door open. However, make sure that they are not too dry and not clotted. Usually, it takes 5-7 minutes. This stage is perhaps the most responsible for making traditional pork beshbarmak – it depends on it how delicate, juicy and harmonious the result will be a dish. 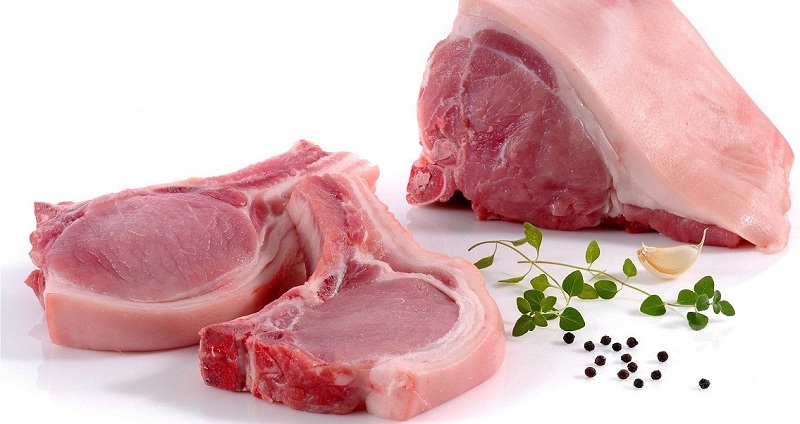 Once the meat has cooled to a comfortable temperature, remove it from the bones and divide it into small pieces. It is better to do it not with a knife, but with your hands – so you can observe the subtleties of the national recipe. Peel off the bulbs and cut into thin rings or half rings (depending on the size of the heads). If you managed to remove a sufficient amount of frozen fat left after boiling pork, put it in a deep frying pan and heat it over medium heat. If there was very little fat, add butter (not a vegetable!) To it. Fry the onion rings to a transparent golden state, lightly salt it and fill with a glass of broth. Add ground pepper and spices, then cover and stew on low heat for 1-2 minutes. Pour the liquid from the pan into a separate saucepan, and put the stewed onions on a plate. Top up with 2 more glasses of onion broth, bring to a boil and send homemade noodles there for about 7-10 minutes (depending on the thickness of the rhombus). After the specified time, remove the finished lozenges using a skimmer, put them in a colander and rinse with cold running water to get rid of the stickiness. Mix the noodles boiled for beshbarmak with half the fried onion and place on the side of the dish. Place the pork in the center, put the rest of the onion rings on top, sprinkle with pepper and chopped parsley (to taste). 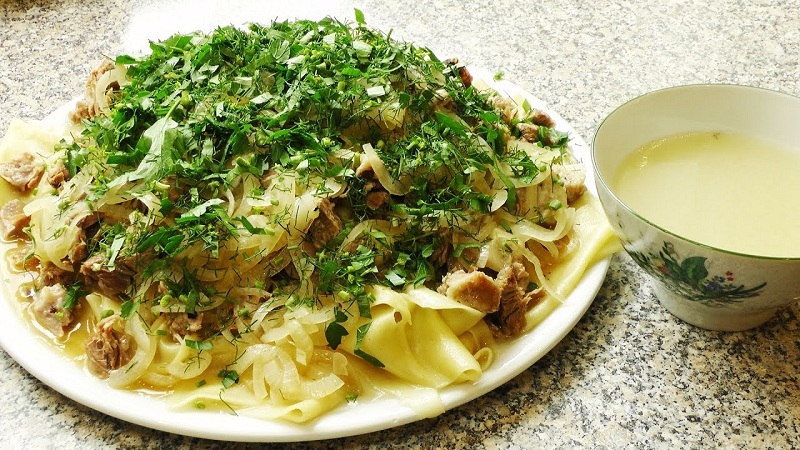 Beshbarmak pork is served as a common hot dish with separate portions. Separately, each guest in a bowl can serve hot broth, abundantly sprinkled with chopped greens. The taste of this amazingly satisfying, but at the same time delicate dish, will conquer everyone literally from the first spoon!